We are excited to invite you to attend April 26th, 2019 from 8am - 7pm for our biggest event of the year! We invite you to attend the 15th Annual Houston Human Factors Symposium to be held Friday April 26th at the University of Houston - Clear Lake. This one-day symposium in Houston brings together human factors and ergonomics professionals and students across Texas. Bio: Osama leads the User Experience design team in delivering purposeful, engaging, and intuitive digital experiences informed by user research. The team’s core activities include information architecture mapping, wire framing, prototyping, visual design, and design specifications. 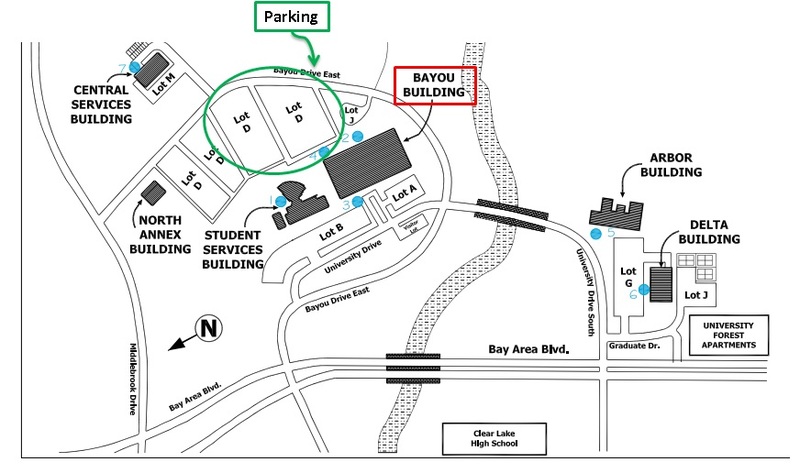 Parking: Please park in the visitors garage for 9 Greenway located on City Club Drive. We invite you to the Houston HFES One-Day Symposium, a forum for sharing information, case studies and new ideas within our community. This community consists of human factors and ergonomics engineers, researchers, designers, developers, designated company specialists and students in the region. Featured speaker, Claudia Acemyan, Ph.D. will present "Making Secure Systems Usable"
Michael Merta, Angie Avera, Phil Kortum, Camille Peres, Christie Sauers. Join us on June 3rd, 2016 from 8am - 7pm for our biggest event of the year! Glenn Harrington, Ford Motor Company. We invite you to attend the 12th Annual Houston Human Factors Symposium to be held Friday June 3rd at the Gilruth Conference Center, NASA JSC. This one-day symposium in Houston brings together human factors and ergonomics professionals and students across Texas. Our quarterly HHFES events are wonderful opportunities for members to connect and share. However, the purpose of this event is to provide an informal forum without an agenda for HHFES members and non-members to gather, introduce one another, share information, and network. This is also an opportunity to provide feedback to the chapter leadership on this and other functions as a means to meet the needs of the membership. We look forward to seeing you there!! In the oil and gas industry, rapid technology adoption from the well site to the refinery has led to the introduction of increasingly complex human-machine interfaces. The introduction of these technologies poses new challenges to managing fatigue-related risks for human operators, who already face challenges associated with working extended and irregular shifts to monitor oil and gas operations. Strategies for fatigue risk management, such as shift scheduling and fatigue assessment surveys, primarily target sleep-related fatigue issues; however recent research has indicated that operators also experience significant performance deficits from cognitive fatigue due to time on task and/or cognitive load. Moreover, job-related factors such as physical fatigue, psychosocial conditions, operator experience and knowledge, and shift-work can adversely impact operator physiological states in tasks with high cognitive load. Because operator fatigue is a complex phenomenon that is influenced by a variety of person- and task-related factors, comprehensive fatigue monitoring is imperative to effectively mitigate operator performance risks and maintain operator health. This presentation will provide an overview on our industry-academic collaborative research efforts towards the development of a fatigue monitoring system that captures predictors for operator fatigue as they relate to physiological outcomes and performance risks in offshore energy operations. Ranjana Mehta, PhD, is an assistant professor in the Department of Environmental and Occupational Health at Texas A&M University and a graduate faculty in the Texas A&M Institute for Neuroscience. She serves as the director of the NeuroErgonomics Lab and Co-Director of the Texas A&M Ergonomics Center. She received her Ph.D. and M.S. in Industrial & Systems Engineering from Virginia Tech (Human Factors), an M.S. from the State University of New York at Buffalo (Engineering Management), and a B.S. in Production Engineering from Mumbai University, India. Projects in her lab include both basic neuroergonomics research (brain-behavior relationships to understand impacts of aging, obesity, and depression on physical functioning) and applied human factors research (examining worker capabilities in complex human-machine systems). Human Factors Work is Fun! Join us on for this great event! Please join us on Thursday, March 13th, 2014: Mark Riddell of the TMG Communication and Human Performance Network will be talking to us visualization methods.Mark will outline three opportunities to use visualizations to improve worker performance and lower operational risks in oil and gas. Please RSVP to Philip Kortum (pkortum@rice.edu) so that we can order enough food. Please join us on October 29th in celebrating National Ergonomics Month by attending the Houston Human Factors and Ergonomics Society’s Career Panel meeting. Human Factors, Ergonomics and UX professionals from a wide range of industries will speak about the work they do and be available for questions at the end of the panel. This is one of our most popular meetings for students, as it provides tremendous insight as to what you can expect when you graduate. 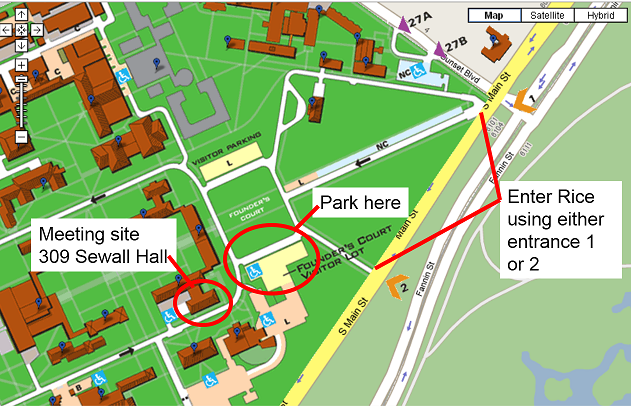 The meeting will be held October 29th on the campus of Rice University, in Herzstein Hall (map and parking info below). Pizza dinner will be served at 6:30, with the discussion starting at 7. For more information please vist the conference site. Captain Chad Tossel (U.S Air Force)will represent the national labs. HF Careers Panel: HHFES works closely with student groups to support their transition to their career. For instance, HHFES hosts an annual Human Factors Careers panel during October and has a lunch with the president at our annual symposium. Symposium: We have a one-day HHFES symposium every spring in the Houston area where professionals and students share presentations and posters on current work and research being done in HF/E. Every 3rd year, we combine with other HFES chapters and hold a Texas regional conference. Quarterly Meetings: HHFES sponsors a guest speaker to talk about their current research in human factors.